This is the first lesson in our study of the 12 bar blues. We will start off right at the beginning, talking about what the 12 bar blues is, how it is constructed, and how it is played. We will then explore some different ways you can voice the chords using our knowledge of rootless chord voicings, chord extensions and alterations. The 12 bar blues is the most common blues chord progression. In it’s most basic form, it contains just the I, the IV and the V chords of the given key. It’s important to understand that the 12 bar blues is a cycle and it is repeated many times during a performance. 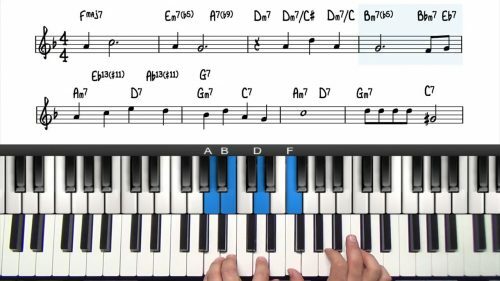 The blues is most commonly played in the keys of F, Bb & Eb. This is because the flat keys are preferred by horn instrumentalists such as the sax and trumpet players. You will also find blues written in other keys but these two are by far the most common. It’s called the 12 bar blues because it’s only 12 bars long. 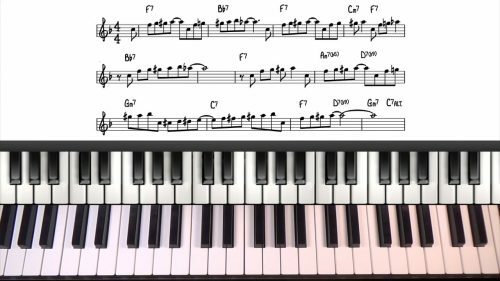 Most jazz standards are 32 bars long and so the blues form is less that a third of the length of a typical jazz standard. The I chord is F, the IV chord is Bb and the V chord is C. In the simple 12 bar blues we play all of these chords as dominant 7th chords so the three chords we will be using are F7, Bb7 and C7. The structure of the blues form is the same in any key so it’s important that you understand it numerically as this will give you the blueprint to find the chords no mater what key you are playing in. We start off in bar 1 with F7 which is the 1 chord. In the simple blues, this lasts for the whole line which is 4 bars, or a third of the entire progression. On the second line, we have 2 bars of the IV chord which is Bb7 and then back 2 bars of the I chord which is F7. On the 3rd line, we have 1 bar of the V chord which is C7, 1 bar of the IV chord which is Bb7 and then a final 2 bars of the I chord (F7) to finish the form. Remember that this is the simplest and most basic of all blues forms but it’s important to understand & internalize this sequence before adding more chords into the progression. In the next lesson we are going to introduce the jazz blues form. The jazz blues contains more complex harmony including both a major and a minor 251. 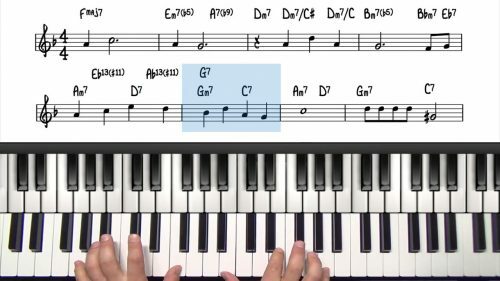 “Straight no Chaser” is most often played in the key of F. Its very closely related to the standard jazz blues so learn that progression first. Be aware that you would never use these root position voicings with the chord tones stacked sequentially. This was just a for demonstration purposes. Instead use your knowledge of rootless voicings, chord extensions and alterations to create interesting sounding left hand voicings. When playing the blues you should practice with the iRealPro. Gradually increase the tempo and you can set the number of repeats to 20 so that you keep cycling around the form.